Nole switched to his French Open kit during the warm-up tourneys leading to the year’s second major, so no need to rehash (here it is, in case ya need a refresher). So instead, here’s a few looks at his practice gear. BTW: Nole has dropped only one set (to del Potro) in his run to the semis, which included a retirement from Victor Hanescu and a walkover against Fognini (who injured himself in that marathon vs. Montanes). Djokovic will play Roger Federer tomorrow. Buy: Lacoste Forest Hills Gym Bag; white, empire yellow, flame scarlet, and blue aster; $160; lacoste.com. TSF loves the skort in particular, with its super-bunched hem and bow off to the side. (We first noticed this on Pironkova back at Indian Wells.) Schiavone’s done a good job mixing up the skort’s three colors — pearl (grey), dark navy, and white — with the irid cocktail (light salmon) and dark navy pieces. We’re also glad she’s opted for the more subtle ruching of the cap-sleeve top, leaving the messy criss-cross design of the tank back in Rome. All that extra fabric is doing nothing for her flat-chestedness. Buy: Lotto Missy Skort, €30.17; Polo, €34.03; Tank, €30.17; Dress, €45.29; Cap-Sleeve Top, €30.17. Let’s leave the grime to the pros, ok? What an entertaining semi! Schiavone played Bartoli, with the defending champ taking out the hometown fave 6-3, 6-3. She’ll face Li Na in the final; their combined age makes this the oldest women’s final since Tauziat and Novotna played Wimbledon in 1998 (via Christopher Clarey, that one). 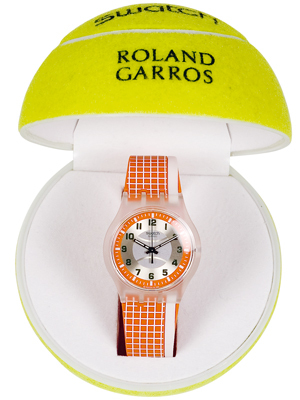 Swatch comes up with the Jeux d’Elite Roland Garros watch — the same shade as the tourney’s clay courts — and puts it in a tennis ball case. 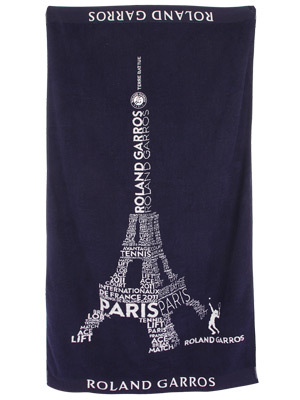 Buy: € 67,00 at storerolandgarros.com. 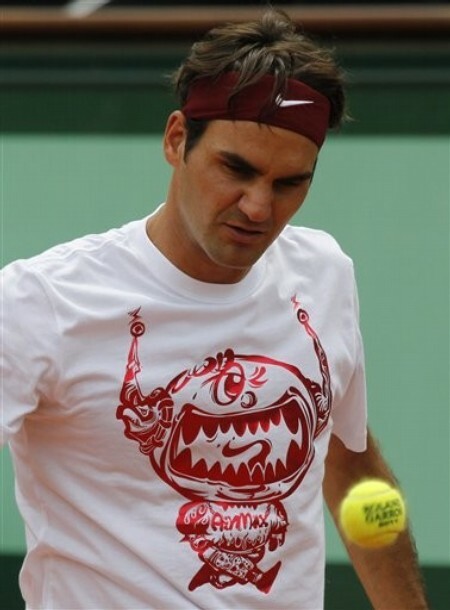 Roger Federer has reached the fourth round of the 2011 French Open after brushing aside Janko Tipsarevic 6-1, 6-4, 6-3. Even from a different perspective — i.e., the buzz words these days are “Nadal” and “Nole” — it’s safe to say that this man can still play some good, clean ball: so far this week, he’s used his efficient serve to rack up only two break points after three rounds of play. Nike Air Max Redux Men’s T-Shirt, $20, nike.com. 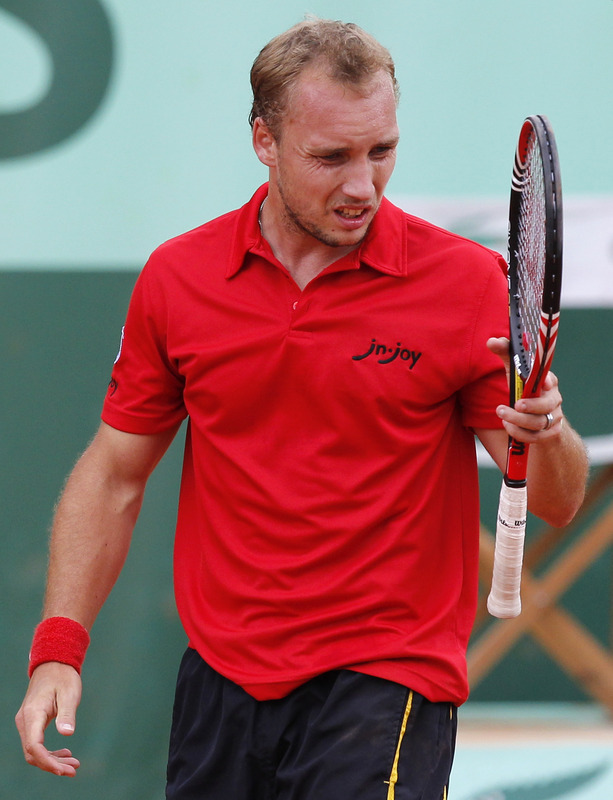 For the curious: Steve Darcis is the tennis face for clothing brand J&Joy, whose logo is embroidered on the Belgian’s polos at this year’s French Open. 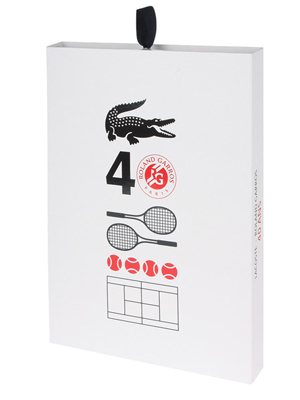 Lacoste and Roland Garros put their heads together for a small collection in time to celebrate their 40th anniversary. Men’s and women’s pieces include polos with embroidered anniversary logos, screenprinted tees (two with photos from a 1973 ad campaign), and custom packaging. 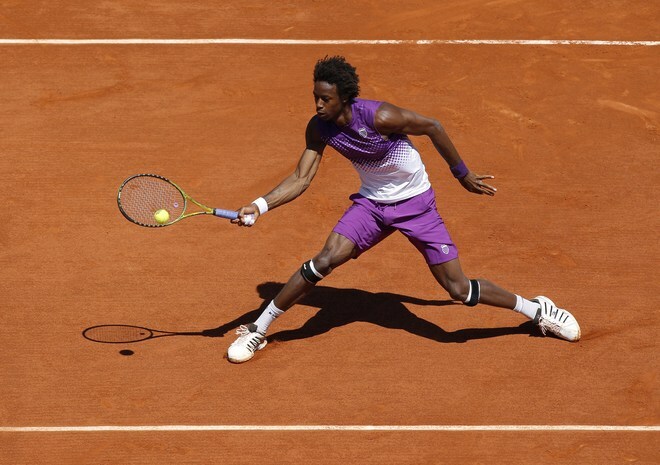 With the Nike men toning down their attire, Gael and K-Swiss have stepped up by using purple and showing off the Frenchman’s guns this spring. The color always reminds us of Serena‘s clay dress from 2007. More info: K-Swiss Fading Stripe Series. No better way to dress up your Nike clothes than with some pearl studs and painted nails. Too bad Julia Goerges couldn’t run away with a first set win over Marion Bartoli, eventually losing 6-3, 2-6, 4-6 to the 11th seed. Draw: Things are all kinds of crazy in that top section of the draw, with both Caro out (upset by Dani Hantuchova) and Stosur going down to Dulko. See how it’s all playing out. 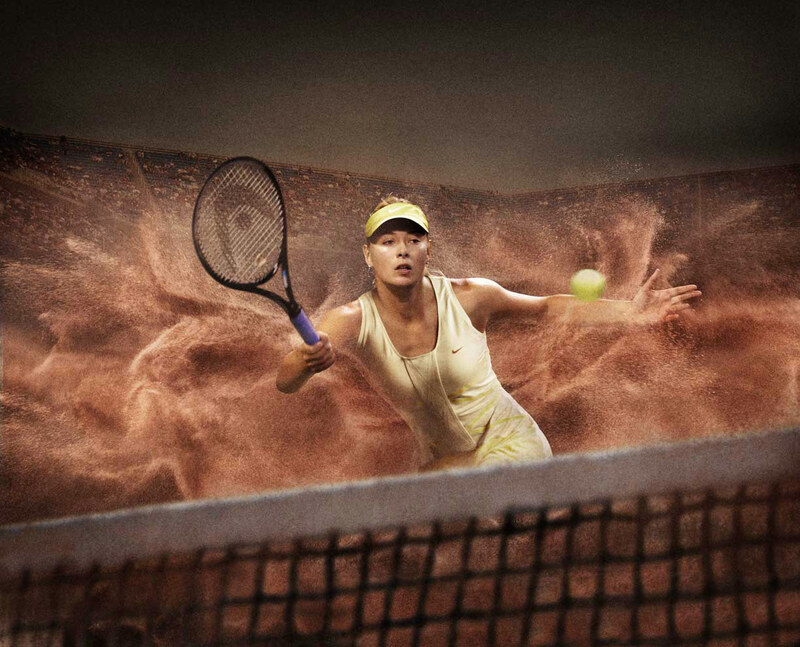 Clothes: Julia wore the Nike Maria Sharapova separates from this season. 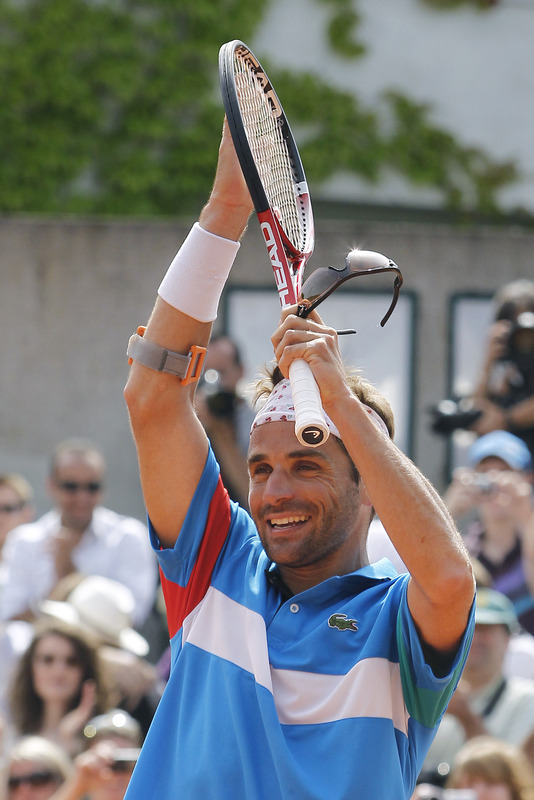 Clothes: The Lacoste kids are still wearin’ the same Striped Tennis Polo that they’ve been using all clay season long. Buy: Air Bacara Ballet by Maria Sharapova by Cole Haan, $138, colehaan.com. And speaking of her off-court dealings, one of TSF’s favorite writers, Eric Wilson, sates his Masha fa(n)scination with this article in the NYT Style Section. Novak Djokovic switched to a new Sergio Tacchini uniform as he hit the clay in Rome earlier this month. We thought that it’d be hard for him to top that black/orange kit — we consider that the best of that season, btw — but this current Serbia-inspired design is playful but not too juniors. From what we can tell, a coat of arms appears on the front lower-left corner of the polo and of course “Nole” printed on the back. The mass-market version has his initials where the coat of arms would be. 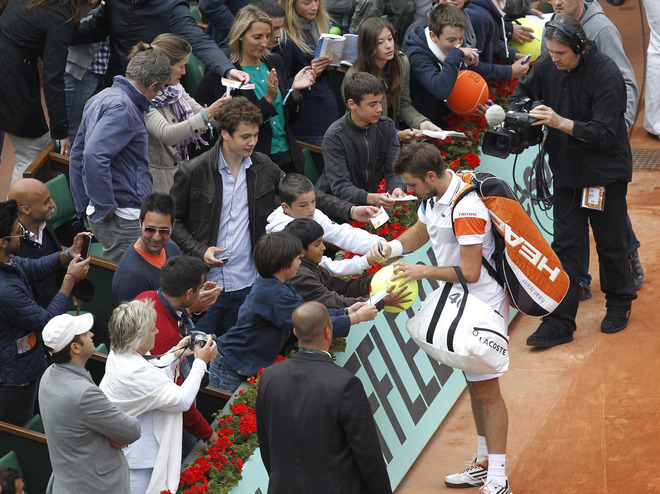 Rolling through Roland Garros: Nole’s still undefeated this year, having beaten Thiemo de Bakker and Victor Hanescu (ret) in the opening rounds of the French. 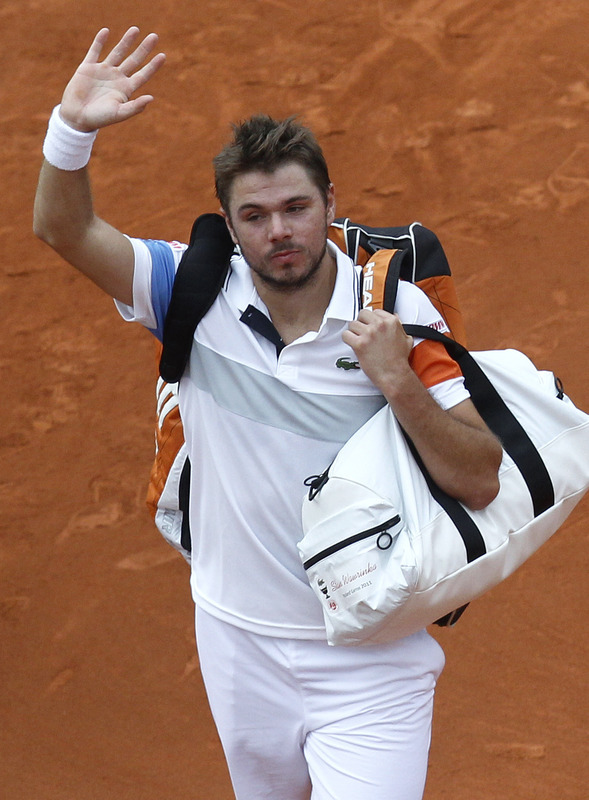 He will face 25th seed Juan Martin del Potro in the third round. Draw: RG Men’s Singles. 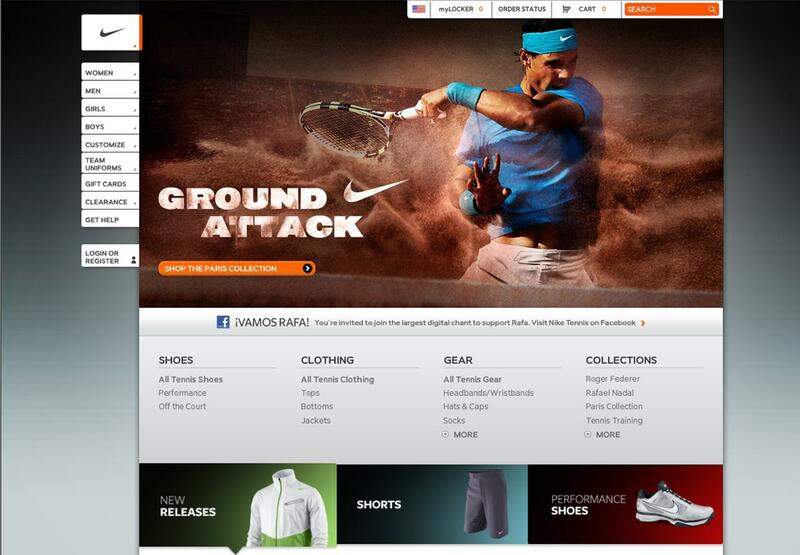 Browse: Polo (“Nuell”), crewnecks (“Nur”), and warm-ups (“Nettuno”) from this collection available at Tennis Express. Jelena Jankovic continues on her bright-hued fashion path with a bright pink stop at this year’s French Open. (She wore pale pink to start out the year in Australia.) The floral pattern on her Anta dress is the same as the one she’s worn this spring (but in green). We might have opted for something other than the purple shoes — perhaps some yellow, to tease out that accent color from her dress? — but we’re loving how it looks against the clay. Paris, Je t’aime: The French Open dress on Maria Sharapova was inspired by the City of Lights, marrying Masha’s ideal for unrestricted movement with the theory behind the Eiffel Tower’s construction: the structure is lighter that it seems. And so they created this lightweight yellow Line 9 dress (referring to the Paris Metro, we assume). Note the top mesh layer on the skirt, which adds to the visible flowiness as Maria moves around the court, and the diamond cut-out on the back. All the lines along the body harken to old methods of corsetry now applied with modern techniques. She keeps going back to corsets, that one. For the curious, she’s wearing a Nike Luna Speed 3 shoe. Buy: Nike Line 9 Knit Tennis Dress, $120, tennisexpress.com. Girl’s best friend: The Tiffany & Co. drop earrings that she’s wearing this week have rose-cut diamonds set in platinum. Buy: Tiffany cobblestone earrings with rose-cut diamonds in platinum; $3,200; tiffany.com. Brackets: At the French, seventh-seeded Maria took out Mirjana Lucic 6-3, 6-0 in the first round and next faces Caroline Garcia. How far do you think she’ll go? Remember, she took a title in Rome. You can see the rest of her section of the draw here.